There are three sections provided on this worksheet for reporting costs. 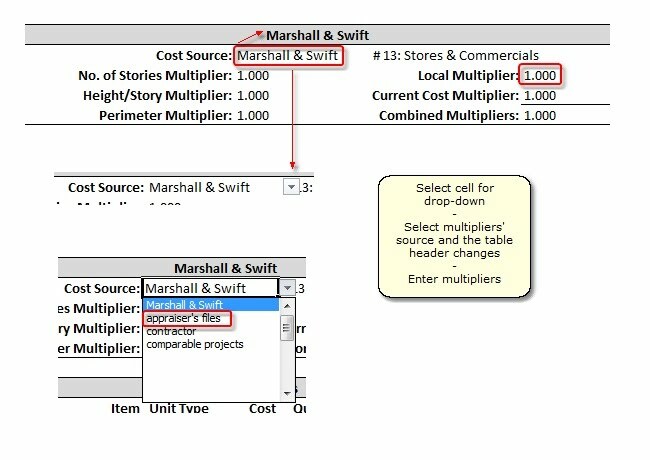 Narrative1 is formatted to work with the Marshall & Swift Cost Service, however this is optional; simply enter in 1 for each multiplier if it is not being used. In the first column, enter a building cost component. Next select or enter the type of measure for the cost component (Sq. Ft., Lump Sum, etc.). Finally, enter a quantity and cost for the item. Narrative1 will then calculate the component cost. Note this section can contain a detailed break-out of cost components or single cost item. The level of detail is very flexible. Site costs are calculated the same way as the above building costs. Soft costs include Engineering, Architectural or other items and can be calculated based on a percentage of the building cost or building and site costs combined. The soft cost categories can be changed by the user. There are two rows for lump sum entries for soft costs, such as leasing and expenses related to permitting and legal costs. This section combines the building and site costs with a line for developer's profit, which can be re-labeled as Entrepreneurial Profit, Builder's Profit, etc. Narrative1 will automatically allocate the building and site costs for physical depreciation. Narrative1 uses a basic physical age-life method to estimate physical depreciation, simply enter the effective age and physical life of the component. Functional and External Obsolescence must be manually entered and are calculated based on building improvement costs This excludes site costs, but includes profit. There are three sections cost sections. Sections and 2 and 3 create sub-totals that feed into section 1. This section is for the land value and associated land value items that may warrant inclusion. Two additional Cost Sections are included on this worksheet. The same instructions apply.